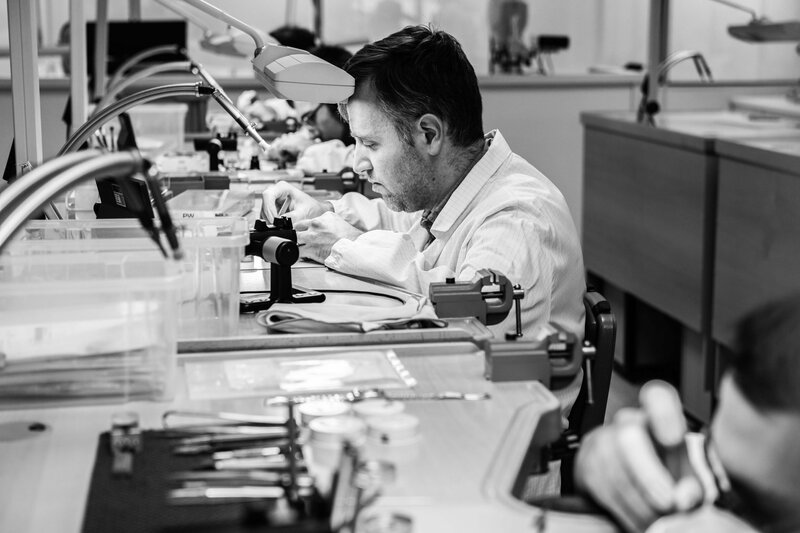 All our watches are serviced to the exacting standards required by our Swiss partners and, as such, following a full service they are returned to their owners in factory condition (where possible) with a comprehensive two-year warranty. Once the watch has been assessed in our Diagnostic Department, an estimate is compiled and submitted to the customer for the work required via email, or post if requested. Upon receipt of instructions to proceed, every watch will undergo our process. Movement preparation and cleaningThis begins with the complete dismantling by hand of the movement, pre-cleaning and inspection of each part. If any parts are found to be defective, damaged or worn they are repaired or replaced, and all parts are then cleaned in a series of ultrasonic chemical baths to completely remove all the old oil, grease and dirt. Case preparation and refinishingWhile the movement is in the chemical baths being cleaned the case will be completely broken down (The case back, bezel, crystal, pushers etc. are removed) and having removed all the seals and gaskets cleaned in large ultrasonic tanks and possibly refinished depending on the type of service and your instructions. Once the case is clean it is reassembled with new seals and gaskets which are lubricated as required with special greases. The case is now ready to receive the cleaned movement. Parts departmentWe carry an extensive range of spare parts for the brands we are authorised to repair including some which are now categorised as obsolete and no longer available from Switzerland. Our stock is kept in a temperature-controlled environment and stored using our inhouse computer system via barcode references to ensure we have a clear view of stock levels. ReassemblyAfter cleaning the pristine components are systematically reassembled and lubricated using up to 8 different fine synthetic oils and greases. The completed movement is now regulated on a timing machine and adjusted according to the manufacturers specification before having the dial and hands refitted. The watchmaker will now reset the clean movement into the watch case. Once the case is closed the watch is then tested for water resistance, our equipment can test watches to a depth of 1000 meters! Quality control and waterproof checkingEvery watch passes through Quality Control, they are the guardians of our quality. They check not only the aesthetics and that your instructions have been completed but also verify the technical characteristics of your watch by testing the timekeeping, water resistance and power reserve. If they are within the manufacturers tolerances then the watch is passed, if not the watch is returned to the watchmaker for further fine tuning. Quality control takes between 2 and 5 days depending upon the requirements and type of watch being tested. Return your watch to youOnce all this work is completed we return your watch to you with a 12-month or 2-year warranty on a full service and 12-month or 2-year warranty on the parts replaced in a partial repair according to the brand. If we have your email address we will send you the Courier Tracking reference to confirm your watch is being dispatched, if we do not have an email address we will call you. We usually use Royal Mail Special Delivery, which is a guaranteed next day delivery and fully insured. Alternatively, you are welcome to come to our office and collect your watch in person.